Background piece on lane splitting in Washington. Lane splitting is specifically illegal, and the Washington State Patrol goes so far as to say motorists should call 911 and report ‘aggressive motorcycles’ if they observe riders splitting lanes. Link to a new petition to amend section 46.61.608 of the Revised Code of Washington, which specifically states lane splitting and lane sharing are illegal in Washington state. These state-specific posts are beginning of tracking and reporting lane splitting news by state. I’ll be adding specific links on the ‘Where else is lane splitting legal’ map page and breaking out news by state as I compile more of it. 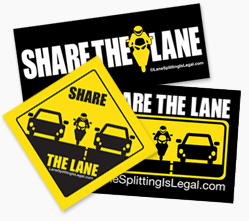 My hope is to make the site not just a PSA site for California riders and motorists, but also a resource for folks who are researching, learning, or working on making lane splitting legal in their home states. 1 Pings/Trackbacks for "New Posts On Lane Splitting In Washington State"